Having 14-ish days off over the holidays was SO nice. My days were filled with friends, family, reality TV, organizing and a whole lot of relaxing. On our last vacation day, in the midst of binge watching Homeland and perusing Instagram, Brent and I were able to peel ourselves off the couch and complete a house project that has been on our "to-do" list for a year. Yes, a year folks - procrastination station right here. 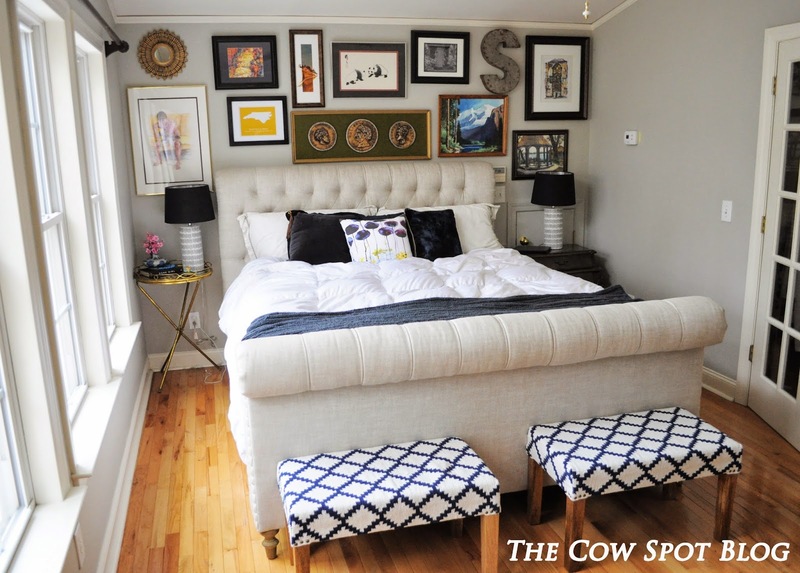 I'm happy to report we FINALLY hung a gallery wall in our Master Bedroom. 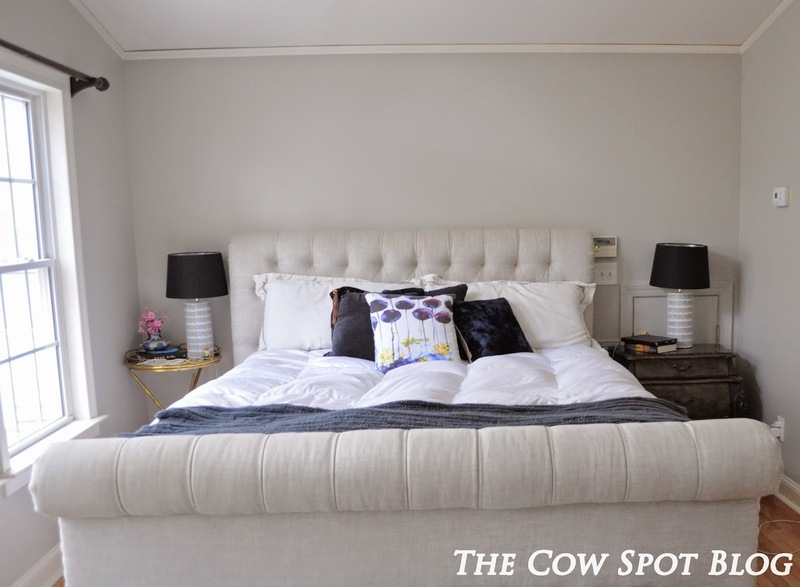 Our master bedroom has gotten little to no attention here on the blog; which is funny because this room, especially our bed which we adoringly call "The Cloud" is a major hangout area for us. I know this goes against pretty much all rules for "healthy living" but we work, eat, scheme and dream, watch TV and of course sleep in the cloud. Who can resist a giant fluffy, soft, warm landing pad? Not us! Our room was happy enough with great natural light, a beautiful tufted king sized bed, pretty pillows and fun lamps. But honestly, I never feel a room is complete, warm or inviting without some art. 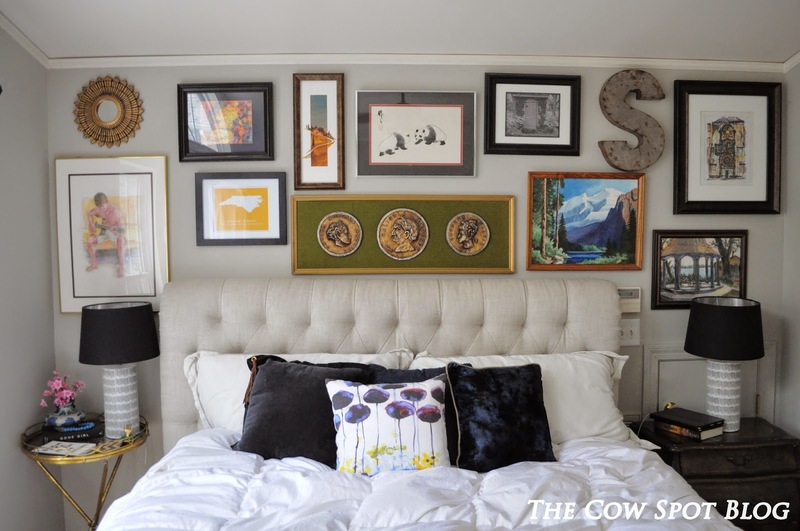 Lucky for us, art we had and the wall above our bed was the perfect spot to display it - gallery style. 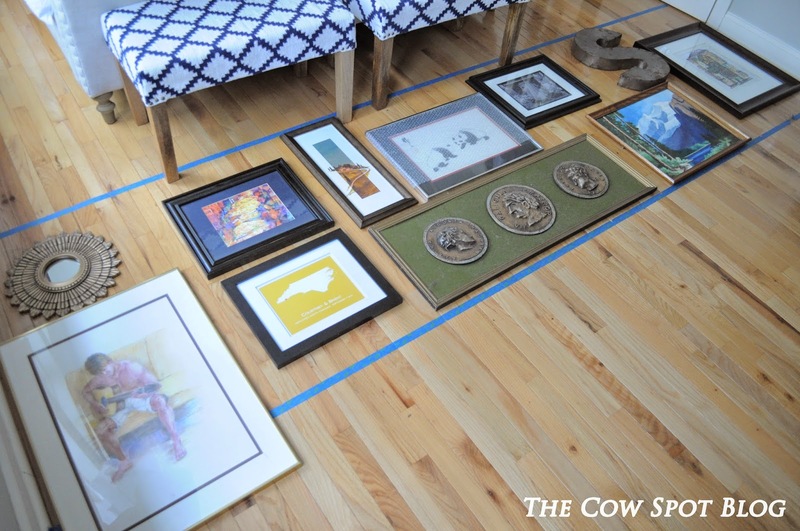 As you all know, gallery walls can come in many a shape, size and context. For us, we simply wanted to fill the wall with pieces that were special to us, bringing in texture, color and interest. To begin we measured the space from the top of the headboard to the ceiling and then taped that space off on the floor in front of the bed/wall where the art would hang. Then, we took the various pieces of art and started placing them within the taped off rectangle until we had the orientation we were happy with. OK, maybe not THAT fast, but truly this baby was up in less than 30 minutes. As Brent installed each new piece I got more and more excited. I love all the color these pieces bring to the room, it makes the space feel so happy and layered. Even better? Most of these pieces are near and dear to us...We have 3 original paintings done by Brent's Dandy, Nancy Niblack. Photography of an outhouse on my Grandmother & PapaJack's Country House property by my Mom, Lori Foster. The North Carolina picture with a heart in Highlands, where Brent and I got engaged, was a gift from my sister and her husband. We have 2 paintings from our travels together, one from Tuscany on our honeymoon and the other from Prague in 2010. A piece Brent picked up in San Francisco of Lombard Street. The gold sunburst is from Ballards, the giant metal S is from Scott's Antique and the coin art was an antique store find in Chattanooga. And finally the panda picture was recently given to us by Brent's mom Cindy. I have no idea where it came from, but it reminds me of Luke and Cows and all other things black and white so I love it. It sure does feel good to re-boot every now and then, but I'm super happy we took 30 minutes to get this wall up, because now that we are back in the swing of real life it's nice to have something so happy and fun to go to sleep under each night. Did you know you can create short links with LinkShrink and make dollars from every click on your shortened links.